While Cydia tweaks can provide usability and customization beyond what Apple allows for in the App Store, there are some apps that won’t run with certain tweaks in the background. Instead of disabling each of your tweaks individually every time you want to use FaceTime, for example, you can activate Safe Mode: which is a plugin preinstalled on every fully jailbroken iPhone, iPad, and iPod Touch that disables tweaks that alter the UI through Mobile Substrate. While it functions on the iPad, InstaSafe was designed for the iPhone’s screen proportions. InstaSafe provides a big button on your SpringBoard for quickly enabling Safe Mode. It’s not the nicest looking custom button we’ve ever seen, but it does what it promises. Tap the button and your device will respring without any active tweaks. There are no settings to configure, you’ll just see a plain (and somewhat out of place) button that says ‘SafeMode’ on your SpringBoard. InstaSafe is a free tweak available in the ModMyi repository on Cydia, but that doesn’t mean you should rush to install it. There are already dozens of ways to activate Safe Mode–set an Activator gesture, press the Safe Mode button in SBSettings, hold the volume up toggle while rebooting–and these other options don’t require branding the first page of your SpringBoard with an ugly button. There may be some benefit to having immediate access to SafeMode on the home screen, but we’re sticking with SBSettings and Activator. If you need quick access to Safe Mode, you will be better off setting a gesture to Activator. 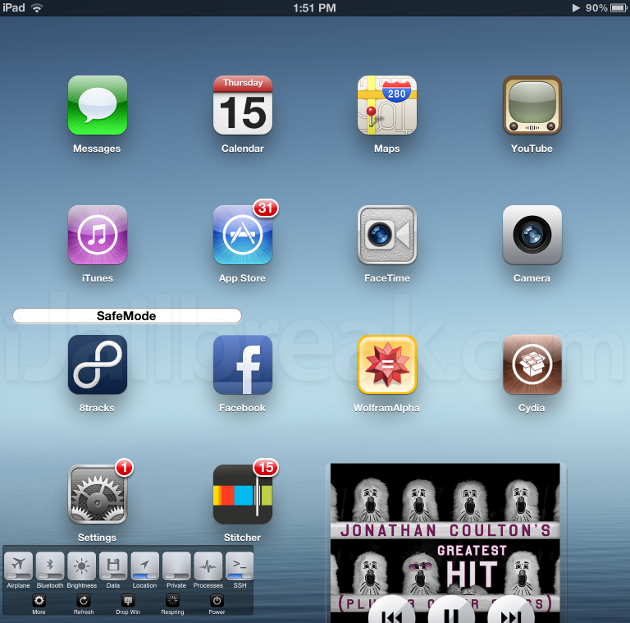 Do you think that your iPhone or iPod Touch needs a Safe Mode button on the home screen? Share your thoughts in the comments section below.